Technology, data, and information are key to success, but tend to prevail only for a limited period. “Fresh data” is what businesses demand and require. Nevertheless, data already acquired can be important evidence of former actions and at the same time create new value, and thereby become an asset for the company. In a way, data analytics can be compared to cooking: fetching data ingredients from different repositories, combining them together, and creating new ways to interpret data is much like creating a meal, all in accordance with an Information Governance recipe. Some of those ingredients are expensive, some are cheap, some are difficult to obtain, some easy, some are fresh, and some must be stored in a special environment. Much like canned food, data can be treated for long term digital preservation. Canned food – what is digital long-term preservation? Keeping to our food analogy, let’s look at our pantry, stocked with canned, or long term preserved food. Keeping data “past its expiration date” is accompanied with a set of risks, that can be mitigated by choosing the right storage environment as well as preparing the information with the right set of requirements. What happens to data if it is stored beyond its expiration date? Without appropriate measures data in long term storage is exposed to a variety of risks. Seeing data in a lifespan of more than, let’s say 15 years, it is exposed to threats towards its confidentiality, integrity and availability that arise from e.g. change to strategy or leadership, file format obsolescence, loss of access information or even loss of the semantic value of the data. A suitable data repository for long term preservation can mitigate or even eliminate these risks and secure vital data for as long as it is valuable for the company. 16 Years ago, the Open Archival Information System (OAIS) Reference Model was introduced and until today it represents the most comprehensive model for preservation, defining both roles, functions and content for long term preservation of data. The data packaging described in the OAIS model is much like finding the right preservation method for your groceries: It defines the right-fit-can for the data to be preserved in, prints the label on the can by using appropriate metadata to ease findability, and selects the appropriate storage. At this point, the expiration date is defined by the Retention Schedule only. A digital repository, that follows the principles defined by the OAIS Reference Model and at the same time conferencing a defined metadata standard (e.g. PREMIS, Dublin Core) is by todays standard, still the best solution for keeping data available, searchable and useable in an authentic fashion. A digital long term repository can be a vital piece to any Information Governance initiative. 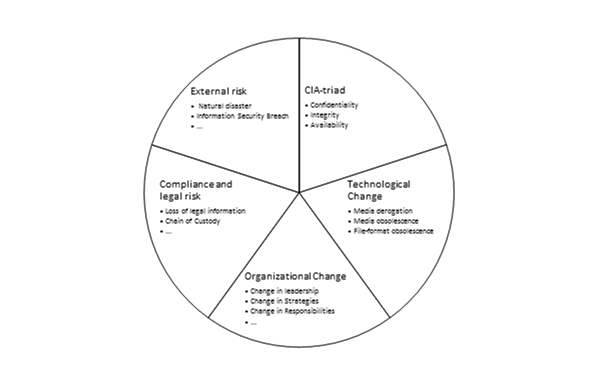 To uphold legal compliance, to mitigate the risks associated with organizational, technological or business change, to define and enable availability, access and re-use of data, to keep data secure with controlled access, to prove a chain of custody or to authenticate actions: Long term preservation maintains the value and legitimacy of data.